The communications giant Comcast announced in February that it would buy Time Warner Cable for $45 billion, creating the largest cable provider in America, with more than 33 million customers. That is about one third of the U.S. cable and satellite television market. FCC approval is required for the merger to go into effect. Critics of the deal say it would lessen competition and lead to even shoddier customer service. They are probably right, as all of us will soon find out, because there is little chance the merger will be stopped. Comcast, Time Warner, and their political fixers have spent years preparing for this moment—by buying off the Democratic Party. Comcast, which employs more than 100 lobbyists, spent almost $19 million last year on lobbying activities. Its president and CEO, Brian L. Roberts, is a golf buddy of President Obama’s, and a Democratic donor who has contributed thousands of dollars not only to the president’s campaigns, but also to the Democratic Party of Pennsylvania, the Democratic Senatorial Campaign Committee, the DNC Services Corporation, and to Steny Hoyer, Kirsten Gillibrand, and Bob Casey. Roberts’ executive vice president, David Cohen, is a former aide to Democratic bigwig Ed Rendell. Cohen skirts lobbying regulations through loopholes, has raised more than $2 million for Obama since 2007, and in 2011 hosted a DNC fundraiser at which the president called him "friend." Cohen has visited the White House 14 times since 2010, including two visits to the Oval Office. He attended the recent dinner for President Hollande of France. Cohen plays a major role in the Comcast Foundation, which has disbursed more than $3 billion since 2001, primarily to "groups that serve African-Americans, Latinos, and Asians" and other segments of the Democratic coalition. You will be surprised to learn that many of the groups to whom the Comcast Foundation has donated now support the proposed merger. Of the $33 million Comcast has spent on political campaigns since 1989, more than half, or some $18 million, has gone to Democrats. 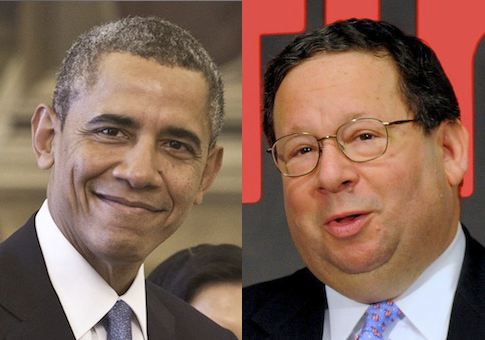 Barack Obama is number one on the list of the top ten recipients of Comcast’s largesse. There are four Republicans on the list. Comcast’s in-kind contributions to the Democratic Party are more difficult to calculate. In a media environment that already tilts leftward, the NBC networks, which Comcast owns, distinguish themselves as especially pro-Obama. Comcast has one channel, MSNBC, which is almost entirely devoted to furthering the president's agenda and the broader priorities of the American progressive movement. How do you put a price on the contributions of the invaluable Ed, Al, Chris, Chris, Rachel, and Lawrence? Where would the Democratic Party be today without The Reid Report? They give so much. MSNBC shares staff and resources with NBC News, whose chief foreign affairs correspondent is a personal friend and tireless advocate of Hillary Clinton’s. NBC Sports, which during its recent Olympics coverage bent over backwards to apologize for Russia, has on its payroll the liberal pink eye victim Bob Costas, famous for advocating gun control during a sporting event. President Obama and Michelle Obama are regulars on the Jimmy Fallon show, and Joe Biden was the first guest on Seth Myers’s Late Night. Biden is always good for laughs. The company Comcast wants to absorb shares its partisan leaning. Since 1989, Time Warner has given $29 million to political campaigns, and more than half of that money went to Democrats. The top three recipients of contributions from Time Warner’s employees, their family members, and PACs are Barack Obama, Hillary Clinton, and John Kerry. President Obama comes first, with more than $1 million. Hillary Clinton comes next, with some $400,000. (Sexism?) Time Warner’s PAC has given lavishly to the DNC Services Corporation, the DCC, and the DSCC. Time Warner’s CEO, Robert Marcus, has donated $8,500 to Democrats since 2010. His giving also favors Democrats over Republicans. So far this cycle Time Warner and its employees have lavished support on Alison Grimes, Cory Booker, Kay Hagan, Mark Takano, and Henry Waxman. They are all—well, you know what they are. Senator Chuck Schumer of New York, who has received donations from both companies, had to recuse himself from Senate business with the merger when it was revealed that his brother, Robert, was representing Time Warner. Comcast and Time Warner are on the list of companies subject to an ongoing Foreign Corrupt Practices Act Investigation. Will Reid and Schumer return the money donated by companies under investigation for shady business practices overseas? The chairman of the FCC, Tom Wheeler, is a venture capitalist and former lobbyist for telecom interests. Obama appointed him in 2013. "Comcast Lobbyist Cohen Meets His Match in FCC’s Wheeler," read a recent headline from Reuters, but the adversarial relationship implied therein seems to me to be vastly overstated. In fact "match" is a good word to describe the similarities between these two men. Both are influence brokers that have successfully navigated the highly complex and highly lucrative maze of telecom politics. Both are Obama campaign bundlers. Wheeler raised somewhere between $200,000 and $500,000 for Obama’s first presidential race, personally maxing out to the campaign and to the DNC, and bundled at least $500,000 for the president’s reelection. Fortunately, we can rest assured that none of this, not Wheeler’s ties to his industry, nor the specter of regulatory capture, nor the shared political agenda of regulator and "industry partner," nor the prospect of future employment, will affect Wheeler’s decision in any way. It is something of a political irony that Republicans, who for ideological reasons are pro-business, have not raised questions about, or objections to, the conjoining of two Democratic institutions into a media trust. If Republicans had any sense, they would wage war against Comcast and its Democratic enablers and turn the merger into a live issue. Needless to say they have not done so, perhaps in the wrongheaded and futile hope of scraps from the table of the Comcast cable beast, perhaps in the foolish and selfish notion that David Cohen may one day add another man to his company of lobbyists. "I have been struck by the absence of rational, knowledgeable voices in this space coming out in opposition or even raising serious questions about the transaction," Cohen said in a recent C-SPAN interview. I am struck by the same absence, but I am not surprised by it. At this writing opposition to the merger seems to be limited to the Writers Guild of America, Washington Post columnist Catherine Rampell, and Senator Al Franken of Minnesota. This is what happens when you buy one political party and disarm the other. Imagine the noises from MSNBC if the merger involved Rupert Murdoch or Glenn Beck or Sheldon Adelson or the K-O-C-H brothers. Criticism would lead the NBC Nightly News with Brian Williams, Costas would interrupt a Sunday Night Football game to decry corporate consolidation, Fallon would crack wise in his monologue. And who are the opponents of high prices, horrible customer service, and sub-standard Xfinity packages left with instead? Stuart Smalley. This entry was posted in Columns and tagged Barack Obama, Brian Williams, Chuck Schumer, Comcast, David L. Cohen, Democratic Donors, Harry Reid, MSNBC. Bookmark the permalink. Matthew Continetti is the Editor in Chief of the Washington Free Beacon. He can be reached at comments@freebeacon.com.